There was one member of CAP 2-7-2 whose status made him a classic ‘man in the middle’– our Kit Carson Scout, Gia. 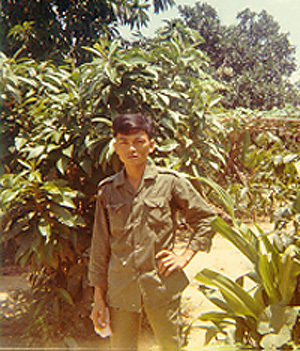 Viet Cong soldiers who got tired of fighting for Ho Chi Minh could take advantage of the Chieu Hoi (Open Arms) program run by the South Vietnamese government. Throughout the war millions of Chieu Hoi leaflets were airdropped all over South Vietnam. 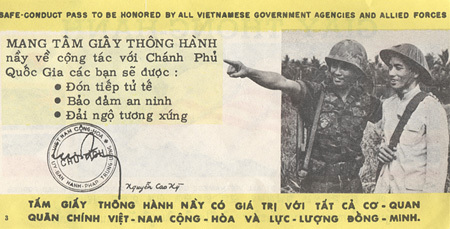 Any VC or NVA carrying a Chieu Hoi leaflet could surrender and get better treatment than soldiers captured on the battlefield. 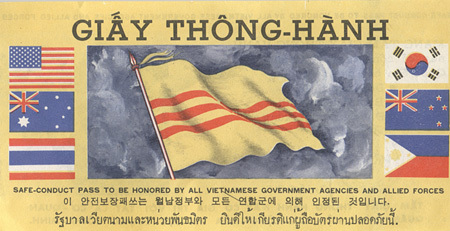 The front of a Chieu Hoi leaflet, exactly half the size of the original. Click here to see the back of the leaflet. Called “ralliers” or “Hoi Chanhs” some of these men were recruited by the Marines and became Kit Carson Scouts. After indoctrination and training they were assigned to U.S. units as scouts and advisers on enemy tactics. An article in the official Marine Corps history of the Vietnam War details how the Kit Carson Scouts were created. I never learned our Kit Carson Scout’s full name, though I once asked him to write his name and he put down ‘Gia’ in my notebook. There were never more than eight or nine KCS assigned to the 35 CAPs of 2nd CAG during 1970, but Gia was a permanent fixture in CAP 2-7-2. Day in and day out he lived among us, drawing his rations, cigarettes and ammunition from the Marines. Each night he shouldered his pack and M-16 and took his place in line when we moved out.I learned little about Gia, other than his name, and don’t think anybody did. He kept mostly to himself. Small, soft-spoken and often nervous, Gia spoke no English, and rarely spoke in Vietnamese. I sometimes saw him talk with our RFs, but he seemed to have no friends among them. Our unofficial interpreter, Balls, treated him with respect, or at least wariness. The Marines paid little attention to him except on those occasions when we asked his opinion on some tactical matter regarding the VC. Over time I began to appreciate his uncomfortable position. As a defector, the VC would kill him instantly if he ever fell into their hands. Our South Vietnamese troops did not trust him because he was a former Viet Cong. He also differed from them because he was equipped and paid by his American employers. Attitudes towards him varied among the Marines. I found no harm in him, never knew him to steal, and appreciated his occasional insights into VC methods. I figured he would fight like a tiger if cornered, but would lay low otherwise. Some Marines disliked him as a former Viet Cong, and were suspicious because he did not provide us with more help. Gia had been in CAP 2-7-2 for some time before I arrived, and was still there when I rotated 10 months later in January, 1971. During that time he was wounded twice — Sept. 10, 1970 and Jan. 18, 1971. I think he was also wounded at least once before I arrived. Shortly before I left CAP 2-7-2 for the States, we were surprised to learn that Gia was getting married. Because he spent most of his days in our ville, I had no idea he had any other life. I gave him the wooden chest I kept at Co Lin’s store as a wedding present, and it seemed he was genuinely pleased. I often wonder what became of Gia when South Vietnam was conquered by the armies of the North. Very likely he was executed, but there is a chance he managed to go underground, hide his past and survive. Washington, D.C.Kit CarsonAlthough Chaplain McGonigal’s 1966 survey and General Walt’s message reflected some of the negative features resulting from Marine infantry units operating in populated areas, Marines more often than not demonstrated that they could work with individual South Vietnamese to bring stability to the countryside. One of the most unusual and yet successful of these attempts was the formation of special cadre made up of former VC. These men, former enemy troops, had taken advantage of the government “open arms” (Chieu Hoi) policy and rallied to the government cause. (*The name of Kit Carson was doubly appropriate since Carson had served with Lieutenant Archibald Gillespie, USMC, during his secret mission to California for President Polk in 1846. According to General Nickerson, another reason for the designation Kit Carson was to “provide the initials KC as counter to VC.” LtGen Herman Nickerson, Jr., Comments on draft MS, dtd lMay78 (Vietnam Comment File). From October to December 1966, III MAF credited the Kit Carson scouts with the killing of 47 VC, the capture of 16 weapons, and the discovery of 18 mines and tunnels.41 The scouts repeatedly proved themselves a valuable tactical asset. For example, in November, one scout attached to the 1st Marines at Da Nang led a Marine company at night over unfamiliar terrain to an objective area, resulting in the surprise and capture of 15 Viet Cong. The Kit Carson program was only part of an intensive psychological warfare campaign that III MAF had begun in the latter half of 1966. In fact, it was an officer in the III MAF Psychological Warfare Section, Captain Stephen A. Luckey, who recommended the formal implementation of the Kit Carson project and it was the Psychological Warfare Section that developed the Kit Carson SOP (Standard Operating Procedure). The section had consisted of only Luckey and a senior staff NCO until 4 August, when General Walt assigned Colonel Robert R. Read as the psychological warfare officer. On 18 September, Read obtained operational control of the U.S. Army’s 24th Psychological Operations Company’s two detachments in I Corps, one at Da Nang and the other in Quang Ngai. Believing that the physical separation seriously hampered the company, Read consolidated both detachments at Da Nang and established there in October a Psychological Warfare Operations Center.